Rocky trains during the early morning in his black chuck high tops. Rocky is one of the all time classic fight pictures. The story of Rocky Balboa, the “Italian Stallion” (Sylvester Stallone), a young fighter from the slums of Philadelphia, is successful as a film because it never abandons its interesting characters and their very human interactions to pursue a safe script. As the story begins, we see Rocky as a small-time boxer, willing to fight for spare change, and earning his living as a debt collector for a loan shark (Joe Spinell), although ironically Rocky doesn’t like to use violence in his work. While Rocky is good natured at heart, he can be fierce in the ring, especially when someone tries to cheat as we see in an early bout. One subplot in the film revolves around his friend Paulie (Burt Young), who lets Rocky complete unorthodox workouts pounding sides of beef in the butcher warehouse where he works, and wants to get in the action when Rocky’s career starts to take off. Another subplot is the relationship that develops between Paulie’s shy sister Adrian (Talia Shire), who works in a pet shop, and Rocky who also is an animal lover. Rocky eventually convinces her to go out with him, and when they kiss passionately, the romance is on. Meanwhile, heavyweight champion Apollo Creed (Carl Weathers), played as a thinly disguised Mohammad Ali, selects Rocky to fight him for a Bicentennial bout, thinking that this will be a lark, based on Rocky’s record and lack of experience. But Rocky sees this as his chance at fame, begins a strict training regimen, and even lets an old antagonist, gym owner and ex-fighter Mickey, marvelously played by Burgess Meredith, become his manager. Rocky wears chucks in the ’hood. Rocky ended up becoming a franchise, with four sequels, due to its great success not only at the box office, but in capturing the Best Picture, Editing, and Screenplay Oscars in 1977. There is a lot to admire in this film. In addition to the great casting, performances, and realism throughout the film, the film is well directed and photographed with greatly contrasting scenes of poignancy and action. Rocky’s character is given ample opportunity to develop, and the script doesn’t take the easy way out. Rocky’s wish to “go the distance” with Apollo Creed is realized, but he ultimately loses in a split decision, avoiding the cliché ending you would normally expect to see. John G. Avildsen’s direction is sharp and focused, giving the viewer a good mixture of comedy, drama, romance, and great fight scenes. Rocky also has a great musical score by Bill Conti, and the orchestrations of the signature Rocky theme develop right along with the plot. A recent critics poll published in USA Today, listed Rocky as the fourth all time best sports film. Rocky trains in the railroad yards of Philadelphia. One of the themes of the film comes out of its motto: “His whole life was a million-to-one shot.” This is believable because of the way Sylvester Stallone approaches the role, and because the surrounding characters are very realistic for the environment that the film creates. You see Rocky used by the system, yet at the same time he is able to overcome the obstacles to success that are thrown his way. Although he comes from a limited circle of friends and supporters, he uses the few resources he has in a very powerful manner. When the chips are down, he is able to hold his own in life and in the ring with the world champion. Did this guy just spar with a statue? 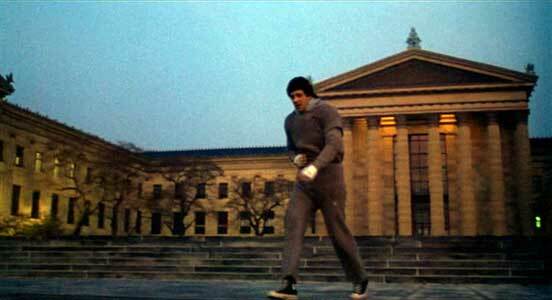 In a triumphant training sequence, Rocky climbs the steps to the Art Museum. There is no question as to the best chucks scene. 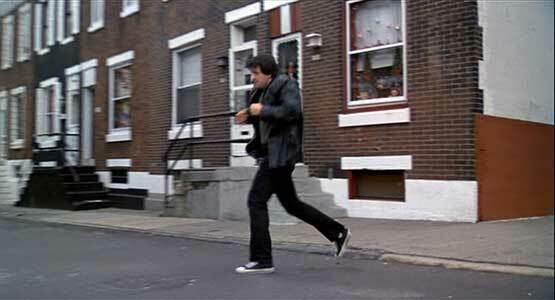 This has to be the second outdoor training sequence in the streets of Philadelphia. The first time you see him run this workout, by the time he reaches the steps at the end of Benjamin Franklin Parkway he is all tired out, and puffing for breath. 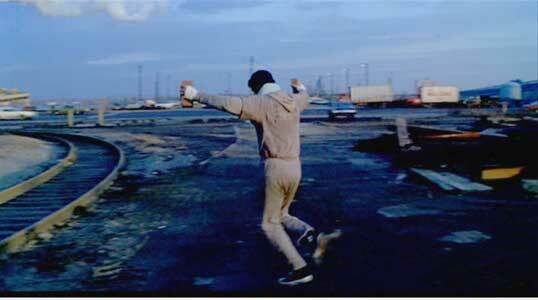 But in the second sequence you can tell that Rocky is on his way to becoming a champ. 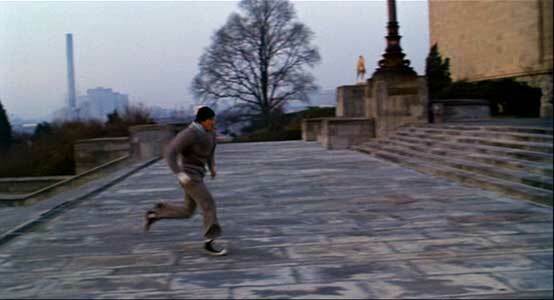 There are great chucks shots as he runs through the town, but when he gets to the top of the stairs and you see him holding his fists up in the gesture of a champion as he overlooks the city, it is a great moment in the boxing film genre. For the first time you hear the fully orchestrated Rocky theme with vocals and the combination of soundtrack and cinemaphotography is powerful and moving. 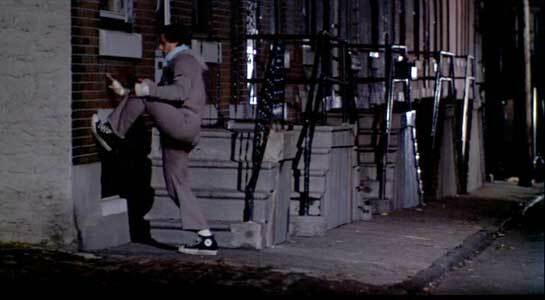 You see this scene and you have to know that Chuck Taylor All Stars are for champions and chucks rule! 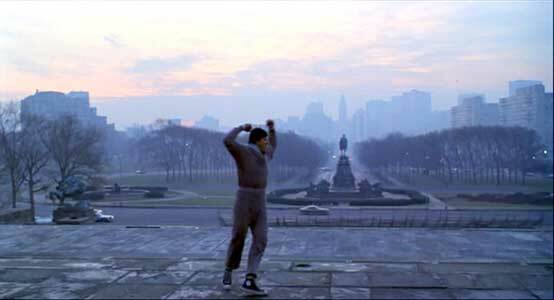 Rocky is the champion of Philadelphia. Rocky. (1976) Sylvester Stallone, Burgess Meredith, Talia Shire, Burt Young, Carl Weathers. Directed by John G. Avildsen. Categories: Drama, Sports.